Will 2018 Be Stratasys Ltd.'s Best Year Yet? Stratasys Ltd. may be on the road to recovery, but that doesn't mean 2018 will be an outstanding year. 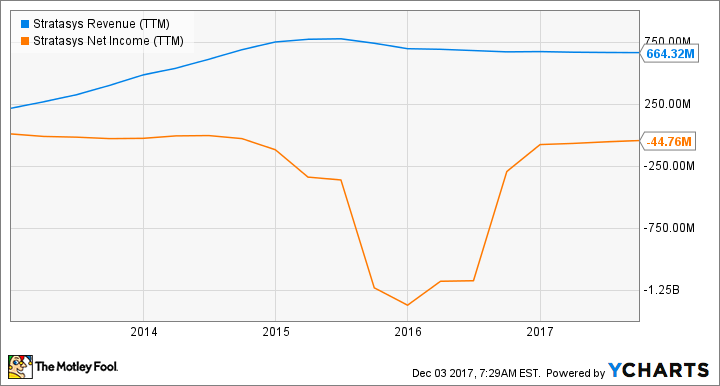 2017 has been an up and down year for Stratasys Ltd. (NASDAQ:SSYS) as investors have gone from being bullish on a recovery of the business to skeptical again. Its biggest competitor, 3D Systems (NYSE:DDD), hasn't fared much better and plunged 29% last month after pulling its full-year guidance. There's a lot of uncertainty in 3D printing going into 2018, but there are also some bright signs. Here's how 2018 could be the company's best year yet operationally. One of the lessons 3D printing companies have learned over the last few years is that their products aren't going to be consumer devices anytime soon. Low-cost 3D printers are great, but if consumers don't know how to use CAD software and have only limited applications for 3D, the market won't be very big. As a result, they're focusing on a potentially massive market of corporate consumers that want to use 3D printing for value-added services to their products. For example, in the last couple of weeks, auto specialist Skorpion Engineering and electronics manufacturer Philips have announced their own applications for Stratasys products to make engineering new products faster and easier for engineers. These are among dozens of such customers the company has been building in 2017. One notable development on the corporate front in 2017 is Ford (NYSE:F), which announced it will be using a large-scale 3D printer to prototype parts and do short-run manufacturing and personalization for some of its vehicles. This is the kind of deal Stratasys can expand with corporate customers and attract customers who could last for years. Making the strategic shift to corporate customers is a welcome change. While a strategic shift to corporate customers and new services like on-demand printing are good news for Stratasys, they'll take a long time to create value for shareholders. You can see that throughout 2017 revenue has been flat or down slightly, a trend that's now been going on for nearly three years. Revenue may continue to be a challenge as corporate customers ramp up their 3D capabilities given the long lead time between looking into 3D printing and actually making production parts. But they should bring with them higher margins than the difficult consumer market. We saw a little highlight of that in the third-quarter release's change to full-year guidance. Management said it expected revenue to be on the lower end of previous guidance but upped operating margin guidance from 3%-5% to 5%-6% for the year. That's a trend investors hope will continue with a more corporate focus. I'm bullish on the 3D printing market long-term and think Stratasys is bringing a much better strategy to the industry now than it was a few years ago. But the improvement investors expect will take time given the long lead time corporate customers have between deciding to explore 3D printing and its deployment at scale. As a result, I don't think 2018 will be Stratasys' best year yet, but rather a step in the right direction to long-term viability. Steady improvements aren't bad for long-term investors, but they may not bring eye-popping returns to a once-hot stock. After a few years of turmoil, that's probably not a bad thing.